I have to be honest – when I’m buying for my boutique, I am searching for items that I would personally wear. When I saw this polka dot floral midi skirt – I knew I was in love! It’s all the girliness I love wrapped up in one beautiful skirt – polka dots, flowers, a great classic length and oh did I mention pockets?! I paired this skirt with this simple white dress also from Morning Lavender that I actually wore as a top. I love simple dresses that can also be versatile separates! I also wore this outfit as a part of my fun collaboration with STYLISH PETITE, who is just as sweet as she is stylish! And I did I mention we are practically the same size?! 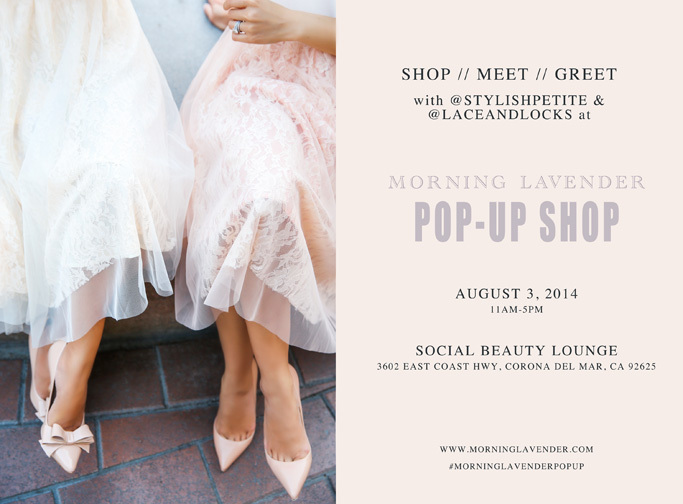 We had a fun time dressing up as girlie girls and I hope you will join us as we co-host Morning Lavender’s first POP-UP SHOP on August 3, 2014 at Social Beauty Lounge in Corona Del Mar, CA! You can find me information below. Please come say hello and join us for a fun day of shopping with sweets, live beats and a girly, good time! Clutch – Ted Baker on sale with Nordstrom Anniversary Sale!